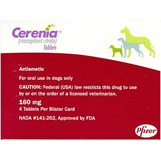 Shop for anti-vomiting medications for dogs at VetDepot.com. Vomiting is a symptom of many different diseases, and depending on its underlying cause it may be a short-lived annoyance or a sign that major troubles are afoot. 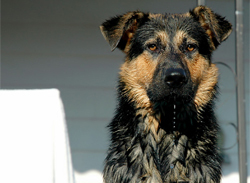 "If your dog has vomited a few times but is not in any distress, you can try treating him at home"
If your dog has vomited just a few times but is otherwise behaving normally, you probably do not need to rush him in to see the veterinarian. Very likely your dog has just eaten something that does not agree with him, and his symptoms will pass. But, if your dog's vomiting does not resolve in a day or two, or if he is very young, very old, or has a health condition that could make him unable to handle even a mild bout of vomiting, call your vet immediately. If your dog has vomited a few times but is not in any distress, you can try treating him at home. Take away all sources of food and water for six to eight hours. If he does not vomit during that time, give him a small amount of water or an electrolyte solution. If he can hold that down, gradually reintroduce larger amounts of water. If after 12 hours of being allowed to drink he is still not vomiting, offer a small meal of boiled white meat chicken (no bones and no skin) mixed with white rice. If he can eat this without vomiting, increase the size and decrease the frequency of his meals over a day or two and then start mixing in his regular food. The whole process should take between three and five days. If at any point he starts to vomit again, see your veterinarian. Whenever possible, treatment for vomiting should be aimed at an underlying condition, but symptomatic therapy may be necessary while a dog is recovering or if a cause cannot be found or adequately resolved. In these cases, your veterinarian may prescribe a special diet and anti-nausea medications.